Puppies are born black and gradually “clear” to their adult color by the time they are two years old. 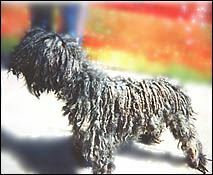 The mature coat color is generally determined by genetics, not a Kerry’s age, and may range all the way from solid black to light silver, and all shades in between. Medium to dark blue-gray is most typical. Lighter colored dogs may have darker points on their face, tail, and feet, while younger Kerries in the process of “clearing” to their adult color may have small patches of tan or brown, especially on the legs. Generally ranges from 17 to 21 inches in height and 30 to 45 lbs in weight. fashion. Puppies may have their ears “pasted” to their heads in order to encourage them to set up correctly. The tail is usually carried straight up, and docked to a length of about six inches, though very rarely dogs may be docked shorter. Kerries are larger than Miniature Poodles and smaller than Standard Poodles. 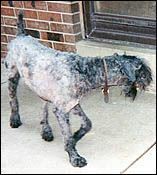 A Kerry’s muzzle is not as fine, its ears smaller and set higher on the dog’s head, and its front and rear angulation is not as extreme. Unlike a Poodle, a trimmed Kerry has a terrier-like trim, especially the face. Kerries are much smaller than purebred Bouviers, which may weigh over 80 pounds (a large Kerry weighs 45 pounds). A Kerry’s ears are never cropped short, and the docked tail is much longer. A Kerry’s head is rectangular, not broad and square like a Bouvier’s. Kerries are never brindle or fawn color, and have soft, dense, wavy, single coats, unlike the straight, harsh, double coats of Bouviers. While both Kerries and Schnauzers may be black, Kerries are never salt-and-pepper, and never have the wire-haired coat of a Schnauzer. Kerries do not have cropped ears like most Schnauzers, and the docked tail is much longer. A Kerry’s facial furnishing are typically much more profuse. Kerries are never black and tan or wire-haired like purebred Airedales. Kerries are not nearly as tall or leggy, and the tail is shorter. Kerry’s legs are much longer than a Scottish Terrier’s, and are in proportion to its body. Kerries are never light blonde color. A Kerry’s coat is wavy and has more body to it (like a Poodle’s) than the Wheaten’s straight and silky coat. A Kerry’s ears are normally smaller and higher set.